Put your life's passions into beast mode with this fashionable item! The center piece Carnelian overcomes negativity, calms anger, brings more devotion, love and honesty into your life. 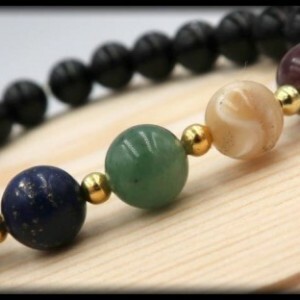 It balances sexual energy, stimulates your creativity, courage, and motivation for success. This design includes the aesthetic Red Tiger's Eye, which aids in enhancing confidence, self-esteem, and integrity. Red Tiger's Eye promotes clarity and intention, while also balancing your libido and enhancing your passion on all levels. Black Onyx absorbs energies from the universe to aid in healing, helps to make wise decisions, and alleviates overwhelming fears and worries,. It also facilitates being the master of your own destiny, promotes vigor, and helps with accessing a higher guidance. 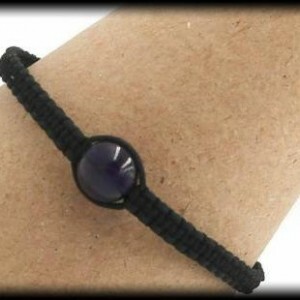 Adding support in clearing and activating the Root Chakra is Hematite. It provides a feeling of stability, dissolves negative, boost self-esteem, and stimulates focus/ concentration. Providing you a boost of vigor and Zen, Hematite will harmonize the mind, body, and spirit! This item is crafted with 8mm beads of Carnelian, Red Tiger's Eye (Grade AAA), Black Onyx, and Hematite. SIZING INFORMATION Please measure your wrist with a measuring tape to ensure the most accurate measurement. If you do not have a measuring tape, you can also use a string by wrapping it around your wrist and then cutting the piece of string. After you have your cut string, place it alongside a ruler and write down your measurement. To ensure a perfect fit, please had 0.5 inch to your wrist measurement, if you want a little room please add .75 inches to your wrist measurement.